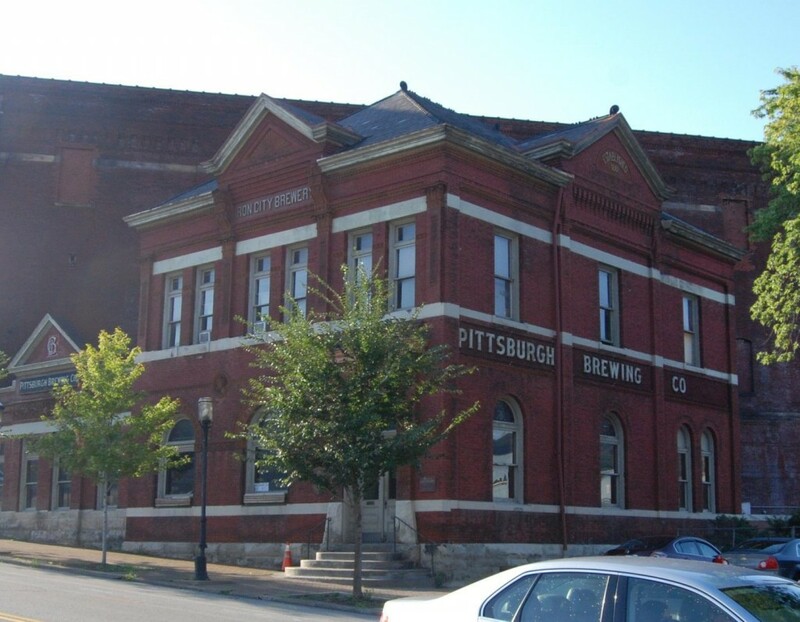 The Polish Hill Civic Association is dismayed at the illegal demolition of historic structures and the lack of regard for community input during the recent master planning process at the Iron City Brewery site. We urge City Planning, the Historic Review Commission and the Bureau of Building Inspection to consider the true wishes of the community and to do everything in their power to protect this significant asset from further demolition. We urge Collier Development and the master planning architects DLA+ to respect all community input that has been provided, and in turn, present at least one genuine development option that accurately reflects stakeholder input to preserve the brewery buildings. Members of the PHCA and Polish Hill residents have been involved in the master planning process through the steering committee and public meetings. The PHCA feels, however, that the community’s voice is not being accurately represented in this process. The number one priority that has been brought up again and again is the preservation and re–‐use of the buildings that make up the former Iron City Brewery site, yet the current master plan includes demolition of more than one third of the existing buildings. At the second public meeting on Oct. 16, approximately 30 of the 40 attendees declined to vote for any of the three development “options” presented to the community because they all included such wide–‐scale demolition of existing buildings. An option that received seven votes is now being pushed as representative of community support. We realize that many of the buildings are in poor condition at this site, but look no further than the Cork Factory Lofts and Bakery Square for examples of properties that were in similar and worse conditions that have been successfully preserved and repurposed at a profit. The brewery site, which sits partly in Polish Hill, is visible from many parts of our neighborhood and is part of the fabric of this community and its history. The development of the site, which we support, will have a huge impact on our neighborhood. During our strategic plan process in 2011, residents overwhelmingly told us that they wanted to see the brewery site preserved, with historic buildings preserved and repurposed. We believe this is the smartest solution, both for our community and the site owner ‐‐ to take advantage of the rich history and assets of the site. We are asking the City to do everything they can to protect the heritage of this irreplaceable gem. We are asking Collier Development and DLA+ for a development option that reflects community input and preserves the economic, aesthetic and social value of the historic structures. The letter was referred to in an article by Diana Nelson Jones in the December 7 edition of the Post-Gazette. Additionally, Lawrenceville Stakeholders, Lawrenceville Corporation, and the Polish Hill Civic Association have signed a letter asking the City to uphold its own regulations regarding historic properties. The letter details the missteps in the handling of the Iron City Brewery planning process. You can read that letter here. There is a petition circulating to protest the illegal demolitions; if you wish to help circulate that petition, email us and we’ll send you a copy. You can sign this petition at the PHCA; there are copies circulating in Lawrenceville also. We’ll post the link to sign the online version as soon as we get it. Yes, sorry, there’s been a lot about the Iron City Brewery site lately. What can we say? Sometimes an issue intensifies. In today’s paper, there’s an article on the recent code violation relating to the removal of 20 feet of brick from the smokestack. The site’s designation as a historic property makes it illegal for the owner to do any site modifications, including demolition, without a permit. This is the second time in three months that the company has incurred a code violation for it’s actions, and the second time they have been penalized. This recent violation is ironically quite timely; it comes just in advance of a public hearing in which Collier Development will argue that they should not have to pay the $20,000 fine imposed in Pittsburgh Housing Court for the illegal demolition of buildings on the property in August. A de novo (new) trial will be held on Tuesday November 20, at 8:15 a.m. in the courtroom of Judge Gallo of the Allegheny County Court of Common Pleas, Room 821, in the City County Building. Judge Gallo has discretion to strike the fine as the appellants have requested, or to uphold the fine. This is a public hearing — which means a chance for residents and stakeholders to testify. This is one of those instances where it will help a lot if residents — come out. It means a lot to officials if regular people care enough to show up. If you feel that Collier should be fined for illegal demolition at this protected historic property and you can attend this hearing, please do. 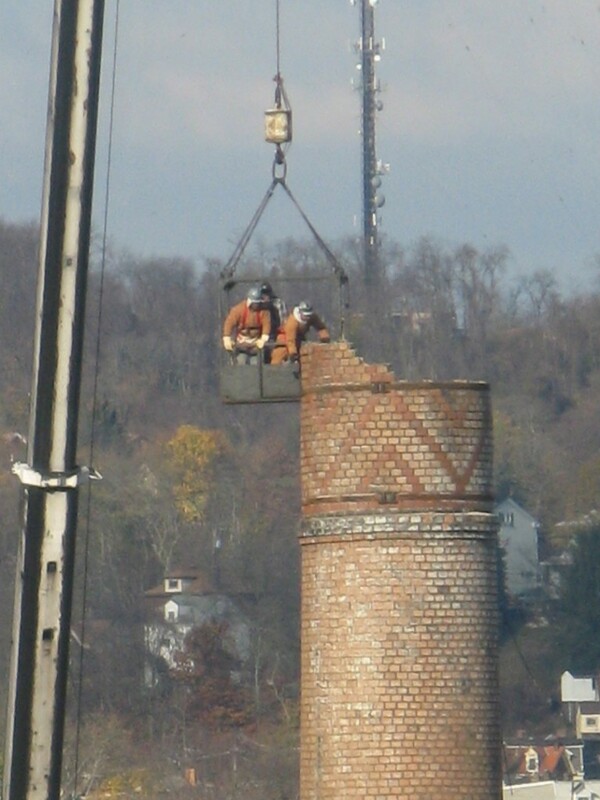 There has been further demolition work on the smokestack at the Iron City Brewery (see our post from two days ago). Now, all the patterned brickwork at the top is gone. Observers report that the bricks are not being removed for restoration, but simply being knocked down into the stack. 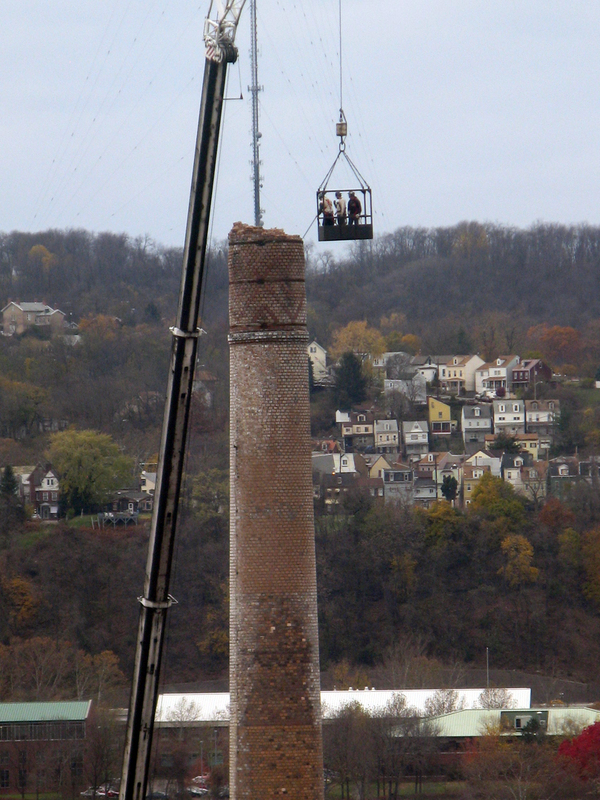 Yesterday, it was reported in the Post-Gazette that the work on the smokestack was actually illegal. The law requires that building permits must be applied for and granted before any site modifications to historic properties. A representative from the Mayor’s office told the Post-Gazette that Collier Development has incurred another code violation with this demolition work and will be penalized. It bears repeating that Collier Development purchased Iron City Brewery fully aware that it was a designated historic site under protection by preservation laws. The company may not have realized how important the historic character of the site was to surrounding communities, or how many organizations and individuals cared. We hope that all concerned parties attend the final public meeting for the Iron City Brewery development planning process. The meeting will take place on Tuesday, November 27, from 6-8 p.m. in Building T on Liberty Avenue. For more information on the meeting and the planning process thus far, check out the update page on the Lawrenceville Corporation’s website. 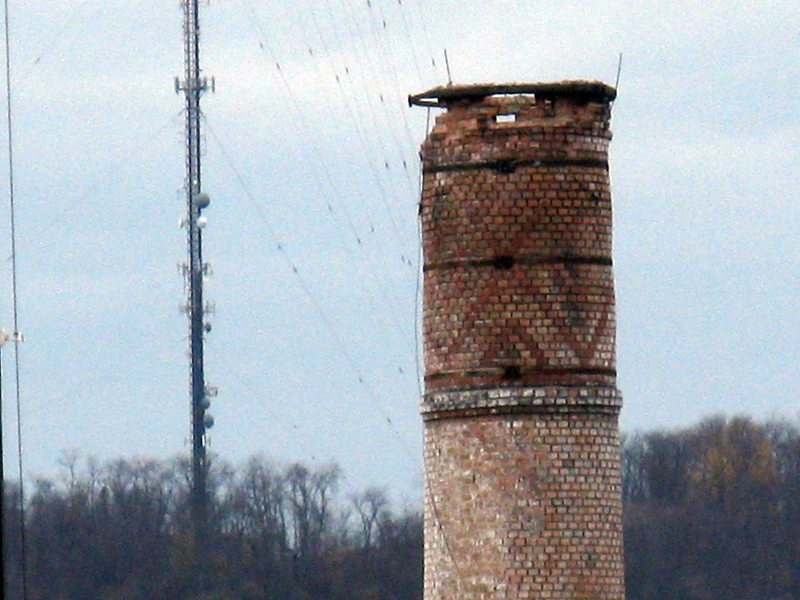 In recent years the smokestack at the Iron City Brewery has shown some serious wear, with lots of holes where bricks were missing around the top edge. 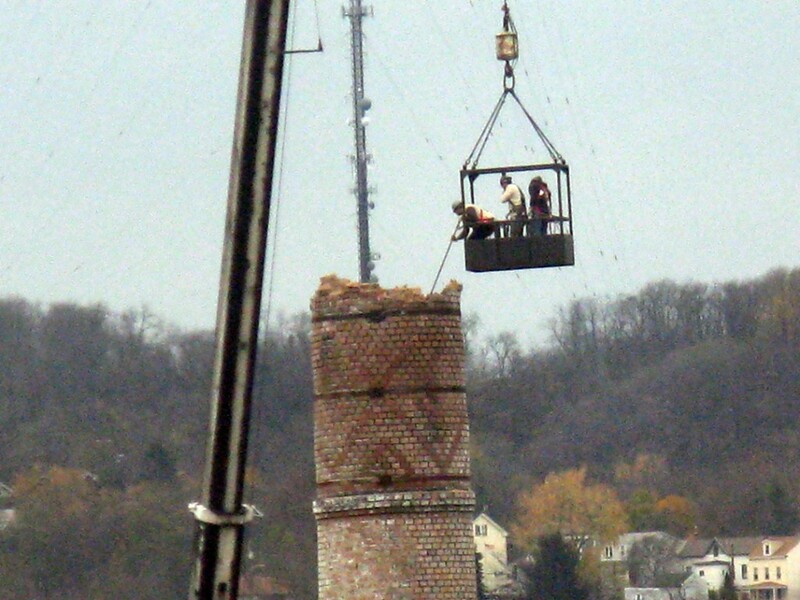 Over the last few days, workers in a cage-platform suspended from a crane have been removing the top courses of bricks. 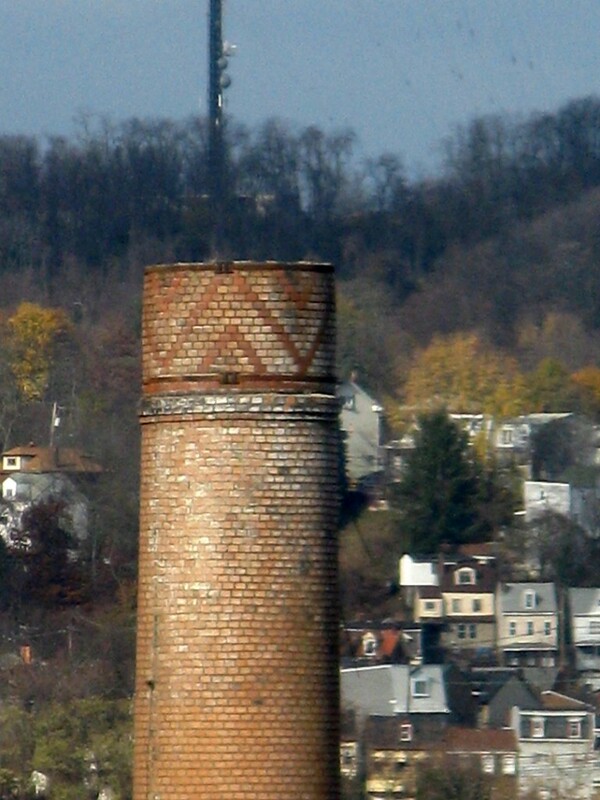 At the recent public meeting for the Iron City Brewery planning process, DLA+ Architects referred to the stack as an element that would probably be part of any redevelopment, serving as a visual symbol of the past history of the site and a landmark — like the row of smokestacks at the Waterfront in Homestead. 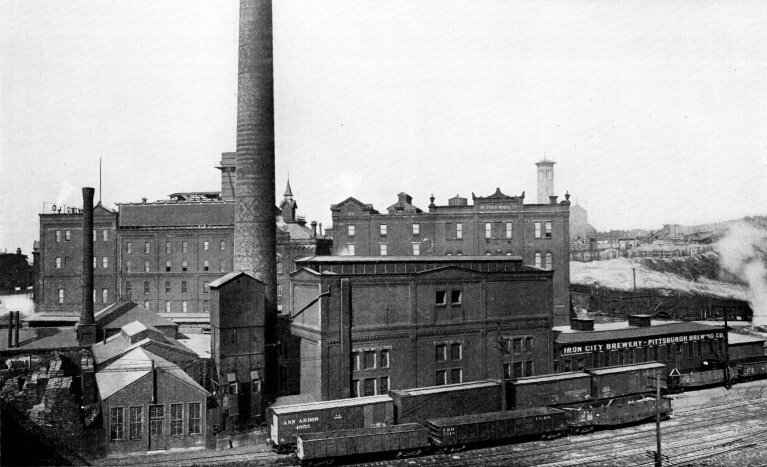 The Iron City Brewery stack has been a familiar part of the landscape for over a century, and we hope it does remain. And that’s a good segue to a reminder for the next public meeting for the brewery site planning process. The meeting will take place on Tuesday, November 27, from 6-8 p.m., and will be held in Building T on the site — that’s the former Uber Brewhouse, on Liberty Avenue. 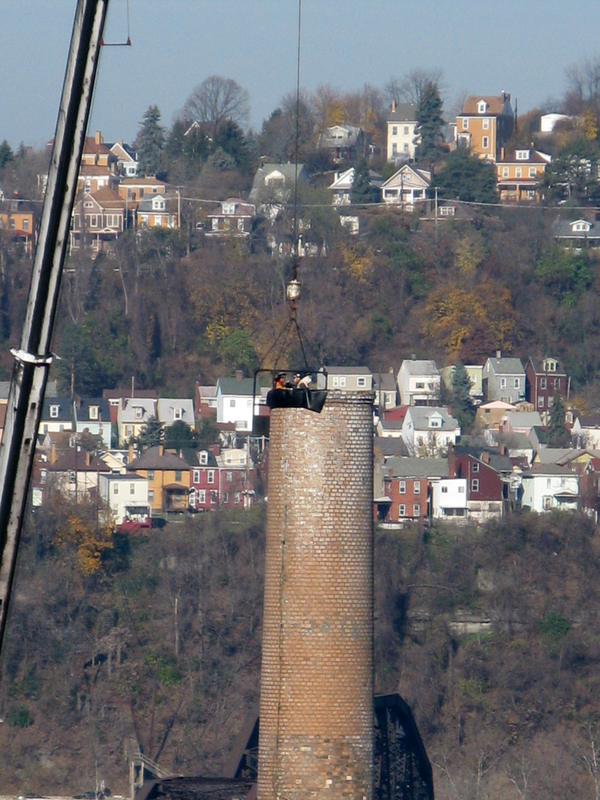 UPDATE: in an article in November 14 Post-Gazette, it was reported that the work on the smokestack was actually a code violation: Collier Development, which owns the Iron City Brewery site, didn’t get a permit for the work. This is the second time that Collier Development has incurred a code violation. The company was fined $20,000 in district court in August for demolishing buildings that were protected by historic designation. This development highlights the need for community involvement in the planning process. There have been two public meetings to gather input for the planning process for the redevelopment of the Iron City Brewery site. The second meeting was detailed in a long post just recently. The third public meeting is coming up on Tuesday, November 27. This development will be a big project, ultimately bringing businesses, visitors, and hundreds more cars to the site, located on the border between Polish Hill and Lawrenceville. It is crucial that residents and stakeholders weigh in during this phase of the planning, when we might able to influence the direction of the development. The PHCA and many Polish Hill residents are keenly interested in seeing a historically sensitive redevelopment; one which preserves as many of the old brick buildings as possible, as well as the unique character of the site. Lawrenceville Development Corporation has been engaged in the planning process with Collier Development, the owner of the Iron City Brewery site. The LDC has added an Iron City Brewery Development Update Center on their website, and we encourage anyone who cares what happens at this site to take a look. The material includes the slide presentations from the two public meetings that have been held thus far and the three plan options that were presented at the October 16 meeting. Add your comments on the Iron City Brewery Plan options by clicking here. What is the "highest and best" direction for development at Iron City Brewery? 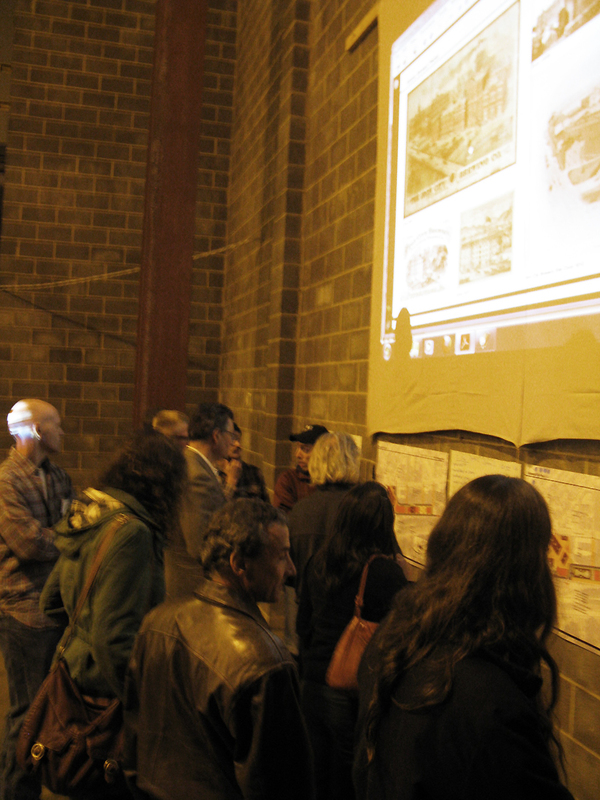 Last night was the second public engagement session for the Iron City Brewery site planning. At this meeting, DLA architects, the firm working with site owner Collier Development and Lawrenceville Corporation during the planning process, presented different possibilities for ways in which the site could be developed. The meeting was attended by about 40 people, including several PHCA board members and Polish Hill residents. The most drastic of the development options would involve demolition of 50% of the buildings on the site. Buildings up for demolition include the very large metal-frame storage buildings from the 80’s (for instance, the tan building in the lower right in the photo below) and brick structures from the 30’s and 40’s. Also being considered for demolition are two 1890’s structures from the main block of five connected buildings (marked in the photo below — it looks like one big structure, but it’s actually two). These buildings are probably the most visible structures on the site as viewed from Polish Hill. Structural engineers have told DLA that the buildings are not safe. The architects say that the buildings can be saved, but it would be very expensive. It has been noted that the structural problems may have been worsened by the tons of rubble piled up against the building when a structure was demolished a couple of years ago. The Iron City Brewery site is large, extending along Sassafras Street in the valley under the Bloomfield Bridge, and it’s clear that whatever development happens here will be a big project. The site is zoned urban industrial, which leaves a lot of room for whatever the developer wishes to do. All of the plans presented included improved vehicle access from Liberty Avenue as well as multiple pedestrian paths. It was also mentioned that for a development of this size, 800 – 900 parking spaces would be required, which would probably include both surface parking and in a new parking garage. The development would include office space, possibly some apartments, possibly a hotel (the developer has already bee contacted by a national hotel chain interested in the site). There would probably be some retail and restaurants, and possibly other amenities. It was clear that DLA did a lot of work on the various options, presenting both detailed site maps as well as a 3-d animation so that viewers could see the proposed ideas from different angles. A look at DLA’s portfolio shows a lot of large public-oriented projects, but none that involved the re-use of historic sites (except for the now-underway Strip District planning project, which includes the partial demolition of the terminal building to allow access to a large residential development by the river). Most of the attendees at the Iron City Brewery meeting indicated that they valued the historic character of the site as a whole, and many felt that preservation of all the brick structures (if not the large 80s warehouses) was of great importance. The meeting ran over the scheduled time due to a spirited discussion, becoming heated at points, about the historic value of the site, and debates about the value of spending millions to save and re-purpose old buildings vs. replacing them with new buildings. Some of the presenters became impatient at what they perceived as a concern with preservation over the “highest and best use” of the site. Of course, the definition of “highest and best use” varies according to who is speaking. The location of the site, at the border of four neighborhoods and surrounded by residential streets, and its convenient location to the busway and downtown, makes the clash of visions almost inevitable. Lawrenceville and Polish Hill in particular are seeing property values increase partly due to the scale and historic feel of their communities, and for stakeholders from those communities, the need for a sensitive, preservationist-oriented development of the site seems clear. A number of times in this meeting, the presenter made a point of saying that while public input can inform or influence the process, it won’t dictate what the developer ultimately will do. But that doesn’t mean that speaking up is futile. The developer is going through this process in order to be eligible for government money — and the officials who dole out that money do care what residents think. We urge all Polish Hill residents to acquaint themselves with the progress of this development and weigh in with your input now. Iron City Brewery has long been a quiet, little-noticed site down the hill, but that’s going to change in the next year or so — and what happens there will have a big impact on our neighborhood, for better or for worse. The development options presented at the meeting will be put up on Lawrenceville Corporation’s website soon. We’ll link to that when it appears. There will be one more public meeting as part of the planning process, and we’ll let you know when that is announced, too. PHCA president Alexis Miller has served on the Iron City Brewery steering committee since it was established early this year. The Master Planning process for the Iron City Brewery site is a joint project between the Lawrenceville Corporation, DLA Architects, and Collier Development. District 7 Councilman Patrick Dowd is also on the steering committee, as well as other representatives from neighboring organizations. Now there’s another chance for the public to weigh in on what should happen at this historic site. Coming up on Tuesday, October 16th is the second “public engagement session” for the planning efforts for Iron City Brewery. The meeting will be in the old Brewery, Building O, from 6:00 – 8:00 p.m.. Use the entrance at 3340 Liberty Avenue (see map below). We hope that Polish Hill residents, particularly those whose homes overlook the brewery site, will make an effort to attend the meeting and share their thoughts on the direction of future development. 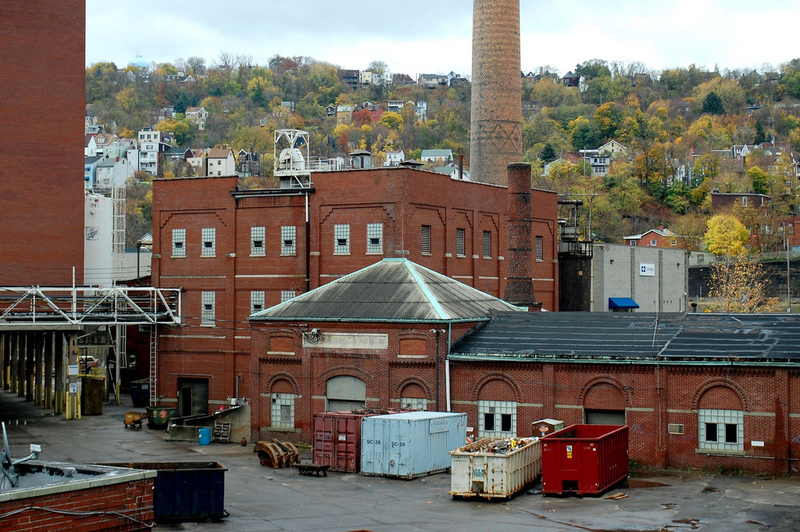 The Iron City Brewery site is important not only historically, but strategically. This large tract of land, right on the busway and located right on the borders of four neighborhoods (Polish Hill, Lawrenceville, Bloomfield, and the Strip), could become something wonderful — if development is guided by community input. Many Polish Hill residents have been watching the developments at the former Iron City Brewery site with keen interest. Now there is an opportunity to weigh in on the development. The first public engagement session for the Collier Development Master Plan for the site will take place on Monday, September 10 from 6:00 – 8:00 p.m.. The meeting will be in the old Brewery, Building O. Use the entrance at 3340 Liberty Avenue. The Master Planning process is a joint project between the Lawrenceville Corporation, DLA Architects, and Collier Development. District 7 Councilman Patrick Dowd is also on the planning committee, as are representatives from neighboring communities, including PHCA president Alexis Miller. 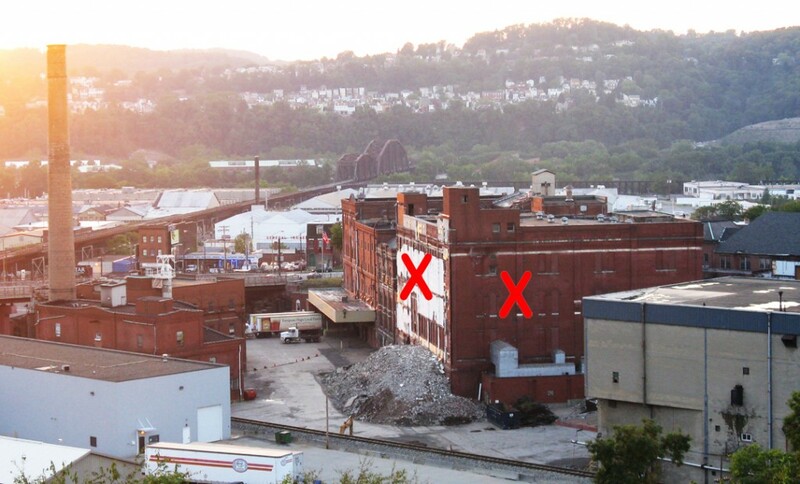 As recently reported in the Post-Gazette, the new owners of the Iron City Brewery have illegally demolished some buildings at the site. The site is protected from unauthorized demolition by its historic status, which the City conferred in 2010. In response to the recent illegal demolitions of historic components of the brewery complex, there will be a peaceful rally to support the historic preservation and responsible stewardship of the site next Wednesday evening, August 8, from 6:30 to 7:30 p.m. on the sidewalk in front of the brewery. The organizers of the rally want to make sure the property owners, the various city government offices that deal with historic preservation and building codes, and other interested folks know that many residents care deeply about the brewery and we are keeping an eye on things there. The organizers say that if 100-200 people show up, it will make clear that this is an issue with broad community support- in Lawrenceville and across Pittsburgh. Collier Development LLC purchased the Iron City Brewery site in early February and since then, neighbors have been impatiently waiting to find out what they might do with it. Jack Cargnoni of Collier stated that the site could possibly be developed for condominium housing, warehouse flex buildings, or perhaps a hotel. Due to the size, strategic location, and historic significance of the property, the question of its eventual development is one of keen interest to bordering neighborhoods, including Lawrenceville, Bloomfield, the Strip District, and Polish Hill. The site, visible from so many Polish Hill homes, has been part of our neighborhood’s landscape for over a century. It has just been announced that the community group Lawrenceville Corporation will be working with Collier Development to develop a master plan for the site. The involvement of Lawrenceville Corp. means that some public money will be available to create the plan, with Collier providing private financing. 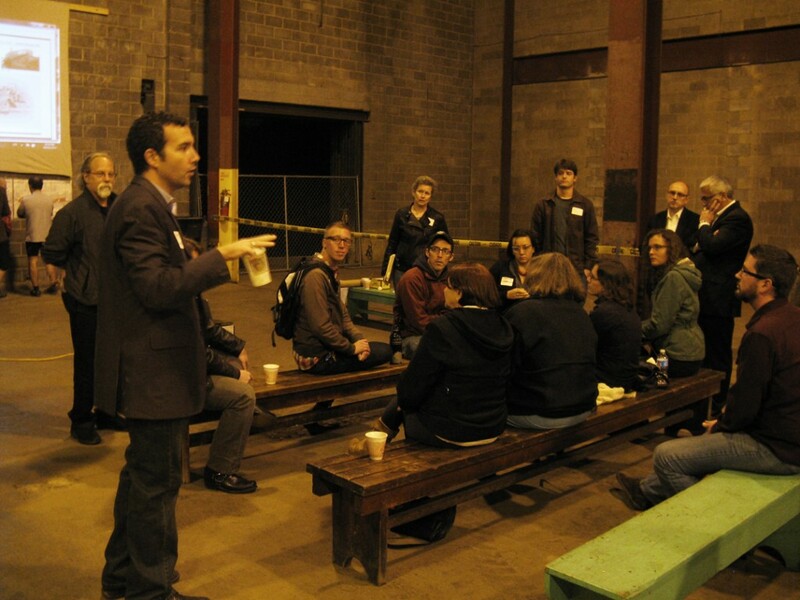 Once a design firm is selected, an announcement will be made for a series of community meetings for stakeholders. The master planning process could result in a plan for development of the property that would combine community-focused direction with the best business opportunities, while preserving architectural and historical elements of the site. A steering committee composed of representatives from local community organizations, the city of Pittsburgh and local elected officials, will participate in the planning process. Read an article on this news from the Pittsburgh Tribune-Review.